August 21, 2009  Uli Edel's The Baader Meinhof Complex is the latest of German cinema's many attempts to tell the story of the Red Army Faction — the leftist "urban guerrillas" who waged a bloody terror campaign beginning in 1970s West Germany. 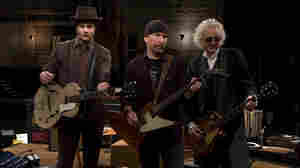 August 13, 2009  Three guitar gods get together to jam in Davis Guggenheim's new documentary. The film weaves together interviews and archival footage to profile Jimmy Page of Led Zeppelin, The Edge of U2 and Jack White of the White Stripes. August 7, 2009  Director Sophie Barthes' debut feature — with Paul Giamatti as an actor who banks his soul for the sake of a role — poses as a brainy meta-comedy. But ultimately, the movie doesn't even offer up a working idea of what a soul is. August 7, 2009  Actress-comedian Charlyne Yi travels the country to "meet" boyfriend Michael Cera and learn about romance in director Nicholas Jasenovec's childish — and cringe-worthy — comic mockumentary. August 6, 2009  A tale of two cities, two cooks and two eras, Julie and Julia is less a solid meal than a pair of complementary snacks. Still, it's deft enough that neither of its heroines exhausts her charm. July 30, 2009  An immigrant marries for the sake of citizenship in the latest from the Brothers Dardenne. But when her husband is threatened by his demons — and her own deal with the devil — she faces an agonizing decision. July 30, 2009  In its best moments, Flame and Citron captures the chaos of a mad scramble to survive. It also aspires to be a national epic — but it's better as a rougher, more universal tale of two men fighting for a deeply personal cause. July 28, 2009  A glimpse into the Arab world that doesn't focus on war or fanaticism, Captain Abu Raed reveals a Jordan that few Western viewers have ever seen, and it tells a story that will appeal to audiences with no particular interest in the region. July 23, 2009  A popular self-help guru learns he doesn't really possess the secrets of life in The Answer Man — a trifle of a film that offers existentialism, religious commentary and ultimately, a dinky rom-com finale. July 16, 2009  Set during the final 10 days of the Third Reich, A Woman in Berlin observes as Red Army troops pillage what's left of Berlin — and take their revenge on the wives, sisters and daughters left behind. July 9, 2009  Viewers with no knowledge of the famed "Rumble in the Jungle" boxing match in 1970s Zaire may have trouble following this story about a related three-day concert. But once the music starts, it won't matter much. June 18, 2009  In a movie that mixes gross-out gags and religious mockery, you'd think the latter would be somewhat smarter. But as Jack Black and Michael Cera stagger through antiquity, everything slides to the same level: exceedingly low.